Professor Collette Tayler is an educationalist, she conducts local and cross-national studies of the ways that social, family and educational policies and practices affect early childhood education and care outcomes. Her work addresses program access and engagement; public and private investments; program standards and quality; the curriculum and pedagogy applied in different services; leadership and staff development; child and family involvement and program outcomes. Her research seeks to explain both universal principles and contextual variations needed to provide exemplary care and education for young children. Professor Tayler holds a PhD in education from the University of Western Australia. 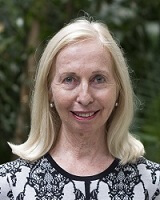 In 2007 she was appointed Chair, Early Childhood Education and Care at The University of Melbourne. Child-initiated and adult-mediated conversations, playful interactions and learning through involvement are integral to young children’s learning and development. Professor Tayler’s research is concerned with the implementation and effects of adult-led, child-led and guided-learning events on the growth of children’s learning and achievement within home-based and early childhood centre-based settings. Her group focuses on adult-child interaction: the implementation by parents and early educators of specific teaching and learning strategies, and the learning pathways of very young children (birth-8years). It addresses children’s interests, child-adult joint attention, child self-regulation, and the fidelity and frequency of use by adults of specific strategies to promote learning. Research participants are located within regional and remote Indigenous communities in the Northern Territory and Western Australia and within culturally and linguistically diverse regions of urban and regional Victoria and Queensland. The research draws its theoretical origins from Bloom (1976) and Vygotsky (1978) and uses study materials and local applications developed from the Abecedarian studies (Ramey, Sparling and Ramey, 2012).